The auditory cortex is the region of the brain that is responsible for processing of auditory (sound) information. The primary auditory cortex is located in the temporal lobe. There are additional areas of the human cerebral cortex that are involved in processing sound, in the frontal and parietal lobes. University of Oregon neuroscientists report that two areas of the mouse brain combine representations of what is heard and anticipated, guiding behavior that leads mice to the best reward. For humans to achieve accurate speech recognition and communicate with one another, the auditory system must recognize distinct categories of sounds - such as words - from a continuous incoming stream of sounds. We all know the feeling of a mobile phone vibrating in our hands when announcing an incoming call. If we perceive these vibrations so clearly, it is due to specialized receptors that transduce them into neural signals sent to our brain. In a scientific first, Columbia neuroengineers have created a system that translates thought into intelligible, recognizable speech. By monitoring someone's brain activity, the technology can reconstruct the words a person hears with unprecedented clarity. Men with dyslexia have altered structural connections between the thalamus and auditory cortex on the left side of the brain, new research published in JNeurosci reveals. Imagine a barking dog, a furry spider or another perceived threat and your brain and body respond much like they would if you experienced the real thing. They say you can't teach old dogs new tricks, but new research shows you can teach an old rat new sounds, even if the lesson doesn't stick very long. Memories are formed through long-term changes in synaptic efficacy, a process known as synaptic plasticity, and are stored in the brain in specific neuronal ensembles called engram cells, which are activated during corresponding events. Early-life seizures prematurely switch on key synapses in the brain that may contribute to further neurodevelopmental delay in children with autism and other intellectual disabilities, suggests a new study from researchers at Penn Medicine published online in Cell Reports. Although sight is a much different sense than sound, Georgetown University Medical Center neuroscientists have found that the human brain learns to make sense of these stimuli in the same way. Preterm babies born early in the third trimester of pregnancy are likely to experience delays in the development of the auditory cortex, a brain region essential to hearing and understanding sound, a new study reveals. 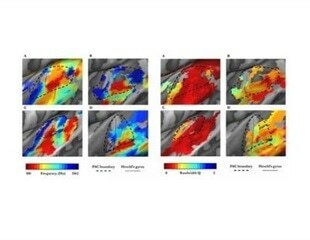 According to a new prospective and observational study published today in The Journal of Pediatrics, very premature infants suffer from an altered cerebral blood flow (CBF) of key regions of the brain which may help to warn of complications in brain maturation, far sooner than conventional imaging could visually reveal. A study presented today at the annual meeting of the Radiological Society of North America (RSNA) suggests that neurofeedback training has the potential to lessen the severity of tinnitus or even eliminate it. Whether it is dancing or just tapping one foot to the beat, we all experience how auditory signals like music can induce movement. Now new research suggests that motor signals in the brain actually sharpen sound perception, and this effect is increased when we move in rhythm with the sound. Salk Associate Professor Tatyana Sharpee has been awarded a grant of approximately $950,000 over 4 years by the National Science Foundation to study how the brain processes complex sounds. This grant is part of a multi-national project together with groups in France and Israel. The origins of autism remain mysterious. What areas of the brain are involved, and when do the first signs appear? New findings published in Biological Psychiatry brings us closer to understanding the pathology of autism, and the point at which it begins to take shape in the human brain. People who are hearing impaired have a difficult time following a conversation in a multi-speaker environment such as a noisy restaurant or a party. While current hearing aids can suppress background noise, they cannot help a user listen to a single conversation among many without knowing which speaker the user is attending to.